I had the opportunity to eat lunch at a high-end professional office building in NYC the other day. The cafeteria was in the main lobby, and I arrived at the peak hour, so I settled on the last available table in a corner that also happened to be right near the garbage receptacles. Oddly enough, as I devoured my subsidized gourmet platter of food, I couldn’t help but stare at the trashcans, one of which was blue, one green and the other a nondescript grey. What I observed has stayed with me ever since. Every few moments, a different group of executives would arrive with their trays of emptied bottles, plates, napkins and other refuse. In most cases, they were all conversing as they approached the bins and slowed almost routinely to discard the tray’s contents. That’s when I observed a pattern that I never expected: when the person leading any given group paused long enough to separate glass and paper into the appropriate containers, the others that followed almost unthinkingly did the same. But when the person leading the group dumped all their contents at once into the grey container, the persons that followed DID THE SAME. Almost without exception, everyone followed the leader. Now, let’s be clear. These were presumably, well-educated lawyers, financial managers, business leaders, etc. If you stopped any of them, they most certainly would acknowledge that recycling is good for the environment. Some might even know that recycling is the law in New York City. Yet, everyone just followed the leader whether that leader recycled or not. It’s that easy to make a poor decision. Even when you have all the education, all the resources and all the knowledge not to. I remained at my table in that cafeteria but this time I was no longer watching the bins. I was thinking of the millions of kids living in poverty who also follow the leaders. These leaders make it easy to join a gang, become a teen mom, be a bully or just drop out of school. It can be hard for professional adults to separate their garbage, can you imagine how difficult it must be for a child to resist these kind of negative role models when they are surrounded by them and when no one else is there to set a different example? This is why Coach Across America is so important. We have allowed too many youth in this nation’s communities to be leaderless. The result is the failing schools, the crime, and the bullying that have become far too common imagery on our nightly news. It’s time to get serious and invest in a workforce of coaches to lead youth to make the “right” decisions. For all children, a coach is someone they can look up to and trust. A coach is a role model who can guide their decision-making. A trained coach helps them to see beyond the easy choices to make the right choices. Every child deserves a coach. And by investing in one, maybe one day, every child will grow up to be the professional in that office building who approaches those garbage cans and knows exactly what to do. I'm often receiving links to stories about the power of sports. Recently, I saw a story of a high school football team in Michigan who made a secret pact that they would forfeit every scoring opportunity when they got to their opponent’s one-yard line. They wanted to set up one of their teammates—a child who was labeled as “not cool” because he suffered from a developmental disability—to be in a position where he could successfully carry the football into the end zone and score his first touchdown. By the end of that game, his teammates had succeeded. They blocked the opposing team and cleared the way for this “uncool” kid to score a touchdown and be cheered on by the entire community. Afterwards, one of the other high school football players said in tears that he learned lessons from the whole experience that he would take with him for the rest of his life. He explained that up until that moment he had never thought of anyone but himself. But that touchdown helped him to realize that life is really not about “you,” it’s about the actions you take for others. This story about the power of sports led me to ponder…what if every child in this country learned this lesson at a young enough age to guide their entire future? What kind of impact would that have on our schools, communities, businesses and governments? Then, I pondered an even more fundamental question…where do children go to even learn these kinds of lessons today? Unfortunately, the answer to the last question is fewer and fewer places. Too many children grow up in homes with parents who are overly focused on their own economic and personal problems to worry about their kids. And too many of our schools are so focused on the test score that the concept of teaching values and ethics is almost nonexistent. That leaves after-school activities like sports. Sports programs, like that football program in Michigan, remain the one arena where kids learn to work together with values like teamwork, leadership and compassion. When they are led in accordance with the Up2Us standards of sports-based youth development, sports impart on young people a sense of community and belonging that does shape their futures. Which leads me to warn communities, parks, schools and other government officials as they create their 2014 budgets. The elimination of sports programs is the elimination of values. And these are budget cuts which none of us can afford. What if “someone” wanted to hate you? You did nothing wrong to this “someone.” In fact, you don’t even know why this “someone” doesn’t like you. It might be someone from work—someone from your community—someone you met at a social gathering—someone you hardly know. Now, what if you get an odd feeling that this “someone” really is destroying you. They are spreading rumors that are ugly and untrue. The rumors are about your personal life. They are not only untrue but they are embarrassing. And now you suddenly have this sense that these rumors have gotten to your family, your neighbors, and your co-workers. In fact, people are now talking about you behind your back. Stories you don’t even know about. And there’s no way to defend yourself because you don’t even know how this is happening. But it doesn’t stop there. Now you hear something vicious about you on the Internet, on Twitter, on Facebook, on YouTube, and even on Instagram. This can’t be happening. You did nothing wrong. You don’t even know what caused this person to hate you. But it keeps coming. In fact, other people are doing it too. You’re life really is getting destroyed. Now, what if you’re only 14 years old? This month across the country, several children have taken their lives because they couldn’t take the bullying. And yet, we have made little progress on educating those responsible for our youth—our school leaders, our teachers, our coaches—on what to do about it. In part, because many adults confuse “Bullying 2013” with “Bullying When They Grew Up.” It’s not the same—it’s more vicious because there are more means to communicate it. Starting this fall, Up2Us will partner with Ben Cohen’s StandUp Foundation to create a toolkit to help coaches use the power of sports as a solution to bullying. While many youth may associate sports as an arena that fosters bullying, it in fact can be a powerful platform for preventing it. Coaches naturally receive the respect of their athletes. They are in a unique position to address diversity and inclusion among their teams and steer would-be bullies into pro-social behavior. They can also be intentional about engaging those youth who are bullied into participating in sports and facing athletic challenges that can provide them a new sense of dignity and self-worth. And, yes, all of this can take place in the context of “positive peer pressure.” After all, that’s what a trained coach fosters, and that’s what sports are all about. “Stick and stones may break my bones but names will never hurt me.” That was once true before those names ended up all over the Internet. It’s no longer true today. Up2Us is proud to lead a national effort to end bullying through the power of youth sports in America. Let’s get our community leaders and schools to do the same. I would like to acknowledge Diana Cutaia for her work in this area and her support of this Up2Us effort. Dear Mrs. Obama, I would like to propose a new slogan for your second term. In the last four years, I've been honored to be an AmeriCorps recipient and to be responsible for placing nearly 1000 young adults as AmeriCorps coach-mentors in underserved communities across this country. The purpose of our Coach Across America program is to get kids physically active, and we measure our impact based on how many kids we inspire to exercise regularly through sports. But the one thing I've learned from these coaches is that before we can get to the physical health of our children, we really need to address their mental health. The obesity epidemic is far worse in communities where kids are experiencing tremendous amounts of duress because of poverty. Many of these children do not have positive relationships with other children or with caring adults who can inspire them to make the kind of life changes that would lead to their better health. So while the purpose of our program is to promote physical health, we also spend much of our time training our coach-mentors on mental health and addressing the trauma that so many urban youth experience in their neighborhoods. Yes, we focus on their mind. Breaking through the mindset of children who are often stressed, socially isolated or distrusting of adults is the first step to inspiring change in their lives. Once this trust is established, our coaches can then influence our kids to regularly exercise (and to regularly attend school too!). In a nutshell, these coaches create an atmosphere where the mental changes happen---the physical changes then follow. “Let’s Mind” means something else too. Many children grow up in atmospheres where they do not think adults “mind” about them. They may come from homes that are dysfunctional or lack parental authority, or attend overcrowded schools where they see their teachers and other authority figures as not caring. Consequently, they internalize this and learn not to care about themselves or others. This contributes to our obesity epidemic and it also leads to our youth violence epidemic in which children do not value life. We train our coaches to show kids that they “mind” about them. This is a powerful lesson for working with all children, even those who at first seem the most hardened. After all, our coaches can tell you better than me: with a little minding all children are capable of amazing things….like regular exercise, doing well in school, and contributing to their communities. So I say let's capitalize on what you started in the first term by getting at the root issue that isolates children from the kinds of activities that get them moving. In Miami, I met a coach who goes into the public schools and asks the principals to give him the most dangerous kids roaming those hallways. “The kids who have been incarcerated, who everyone has given up on.” He then plucks those kids out of the school, one by one, and takes them fishing. That's right, he takes them fishing. For many of these teenage males, they have never spent any quality time with an older male. In poorer African-American communities, these kids see gangs and violence as the only way to prove their manhood. But fishing alongside of an older male who looks just like them but chose a different path in life is all they need to see their lives differently. "They don't even have to talk to one another," the coach told me. "Just being in each other's presence is sometimes all it takes." The coach told me that after a dozen years, he recently received his first donation of tackle boxes. He's still trying to get enough fishing rods to give one to every child in the program. In New Orleans, I met a football coach who told me how he spent a year preparing his kids to have the confidence to play in a football tournament. "They practiced every day," the coach said, "and they committed to staying in school and staying out of trouble." But when the tournament came, even the coach couldn't change the outcome. "When the kids got to the field, they were in awe. The other teams had uniforms and pads. Our kids only had t-shirts and tennis shoes. If you could see the defeat on their faces before the game even began. They felt that they just weren’t good enough. They immediately turned around and got back on the bus.” The coach is still looking for donations of uniforms. Like many of you, I still have my trophies on the wall from when I was kid. In 2012, the bicycle program, struggling to raise funds in this troubled economy, was forced to discontinue services at this teacher’s school. And that’s when the heartbreak happened: “The kid came up to me just last week and told me that he dropped out of school. ‘Coach’, he said, ‘this cycling program was the only place that ever made me feel I belonged.’"
The cost of maintaining one bicycle for that school translates to the cost of an entire life that will not progress beyond a high school education. That’s a life at greater risk of being incarcerated, unemployed and dependent on public assistance. The alternative was simply a bicycle. The irony of this story is that it was told to me in the lobby of an Equinox gym where tens and thousands of New Yorkers take their cycling machines for granted. I think there’s a message here to gyms and other corporations: use the power of your business to help the communities you serve. What would it take for gyms to have community nights where programs that bring health to underserved youth can share information with their health conscious consumers? For the gym, it would demonstrate that their commitment to fitness extends beyond the bottom line—it reaches out into the community. For the gym member, it would help them to take pride in companies that they choose to give their business. And for the nonprofits, it might just create a connection with one conscientious gym member who could donate a bicycle….and save a life. Gyms and other companies that want to make a genuine difference in the wellbeing of children across America should reach out to me, and I’ll help them set up these community nonprofit nights. And, for individuals, don’t wait for your gym to motivate you, just visit www.up2us.org and let us know if you have sports equipment that we can put into a child’s hand tomorrow. The opportunities for youth to play sports in low-income communities is decreasing. The number of youth playing sports in low-income communities is decreasing. And, the role sports play in addressing critical life-skills development for all youth, regardless of socioeconomic background, is decreasing. For kids in many public schools, sports are going the route of arts and music programs: they are disappearing. And for girls who benefitted from Title 9 legislation forty years ago that protected them from discrimination in sports, their programs are being sacrificed even faster---especially when the school chooses to prioritize saving the boy's basketball team or boy's football team. This is why we are building a national movement to preserve youth sports in America. We are rallying youth sports providers nationwide to join Up2Us to prevent sports from being accessible only to the most athletically-inclined or the most economically well off. Through Up2Us, these providers are finding new ways to share resources, strengthen programs, support coach-mentors, conduct evaluation, tackle issues like field space, and perhaps, most importantly, attract new sources of donations to keep kids from being sidelined for life. Individuals and other donors can help this movement as well: by donating cash, product, equipment, and time at www.up2us.org. The Up2Us model of unifying the field of sports-based youth development to fight for its preservation is critical. Let's use it to ensure access to sports for generations to come. And yes, let's create a model that one day can be used to spurn future movements, like one that revives those arts and music programs as well. The following are excerpts of a speech made by Paul Caccamo at a Congressional Briefing on Capitol Hill on Tuesday, March 20.: In 2010, Up2Us gathered 100 program leaders to Washington and requested a GAO study to explore the state of youth sports. I want to lead off my comments about this study by saying: "This report is exactly why Up2Us exists"
This report points out that sports play a unique role in promoting physical health, academic success and pro-social behavior. To my knowledge, this is the first time the GAO has ever publicly stated the value of sports as an agent of social change in our society. This is an important statement especially because we are one of the only federal governments that does not have an agency or policy director specifically in charge of youth sports. The Dept. Of Education does not require a minimum level of funding be allocated to school sports----though participation in sports is tied to increased academic performance. The Dept. Of Justice, which funds mentors, does not yet include coaches in the current portfolio of mentors, though participation in youth sports is tied to decreased gang activity. And the Dept. Of Health does not have programs linking their support for promoting physical activity to sports activities that are proven solutions to ending childhood obesity. The report points out another important challenge facing youth sports in the years ahead: that the infrastructure that is necessary for youth sports is crumbling. At Up2Us, we know firsthand from our members that in many cities kids can’t play because they have no busses or transportation to get to the games. We know that school gyms are now classrooms, cafeterias are makeshift gyms, courts are in disrepair, and fields are often padlocked after school. We know that equipment is in dangerous disrepair and some teams are forced to share uniforms. And we know that schools and communities are lacking trained coaches during daytime hours when kids need them the most. 1. The report states that opportunity to play sports are increasing based on evidence from 2000 to 2006 and interviews with a dozen officials. Yet, Up2Us has found that $3.5 billion has been cut from public school sports programs based on data collected from almost 500 public schools and districts across the country in the past two years. 2. The report says that roughly 30% of public schools charge fees or “pay-to-play” and that this percentage has not changed by much between 2000 to 2006. Yet, Up2Us has found that the past 3 years have been devastating economically to many communities. Pay-to-play is now surging as a practice and is embraced by 43 states. As a result, at least 40% of public schools charge fees as of 2010. 3. Finally, the report mentions that schools that charge pay to play or other fees sometimes waive these fees for youth who cannot afford them. Yet the report does not going into further detail about whether the existence of these fees is a barrier to prevent poor youth from even trying out for sports; whether these fee waivers tend to favor talented youth over non-talented athletes; and what happens to schools in the poorest public school districts in which no student is able to afford a fee. I will tell you what happens. Their sports programs disappear. Despite these discrepancies, I am pleased that at least we are finally having this dialogue about the State of Youth Sports in America at the level of our Federal Government. I thank all the members of Up2Us who petitioned in Washington to make this dialogue possible. Thanks also to the leadership of Congressional Youth Sports Caucus. As this report makes abundantly clear, our endgame is not to fight for sports to make the next great team of American all-stars, but to protect sports to ensure the next great generation of American citizens. The director of an Up2Us program once told me the story of her childhood. She grew up in a housing project where her mother had her when she was a teenager, and her grandmother had her mother when she was a teenager. 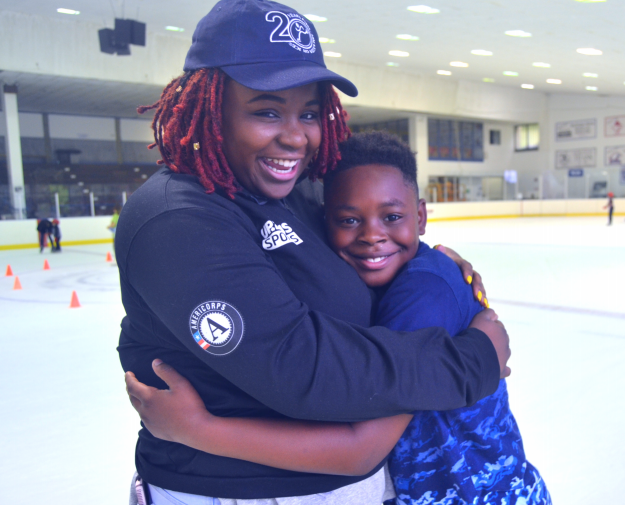 She was told never to expect to leave the housing project or the cycle of poverty that she was born into because it “just didn’t happen.” But throughout her childhood, she ran track and played sports—and her coach had different dreams for her. Her coach told her to imagine college, to imagine success, and to imagine a life beyond the projects. With her coach’s ongoing support, she set goals for herself as an athlete and a student. She used the skills she learned from being part of the team to become successful in college, in her career and in life… Can sports end poverty? Yes they can. And I think the model for doing so goes something like this: we train coaches to inspire young people in areas of extreme urban and rural poverty. These coaches coach after school, but they also meet with children during the school day to “check in on them” and help them set weekly goals for themselves. These goals include everything from life skills, educational goals, employment skills, to simply believing in themselves. The coaches also create expectations for the teams so that the kids can learn from each other on and off the field. This includes teammates holding each other accountable for being on time, working together, resolving conflict, focusing on common goals, encouraging each other’s success, overcoming failure, and continuously setting higher expectations. Sounds awfully like employees at Microsoft or Apple. Through this model, sports can provide children the skills they can use in future careers in businesses, nonprofits and government agencies. I get to see sports do this everyday. Not just through the more than 500 Up2Us member organizations that conduct sports-based youth development programming in every state in this country, but through the coaches in the Up2Us Coach Across America program. Coach Across America is an AmeriCorps program that challenges adults to spend a year in service inspiring low-income youth through sports. AmeriCorps is a federal program that was started to end poverty in this nation. Coach Across America is the sports solution that accomplishes this goal. Okay, the title might be hokey, but this is perhaps the most simple lesson plan for the U.S. Secretary of Education Duncan: if we are going to address dropout rates in schools, Race to the Top, No Child Left Behind, and education reform in general, we need to address the role that sports play in motivating children to succeed academically. No doubt Secretary Duncan has a challenging job in trying to reform public schools where the dropout rate is above 50% in many urban communities and hovers around 30% nationwide. Yet, the Secretary, himself, knows the power of sports. He played basketball, coached basketball, and was an all-American in basketball at Harvard. In fact, he credits basketball for providing him his team-oriented and highly disciplined work ethic. So, Secretary, why not make basketball part of your own lesson plan for education reform? We know that students who play sports are more likely to have better grades, higher educational aspirations and advanced educational achievement beyond high school. We also know that they are absent from school half as much as non-athletes, they get in less trouble, and they pay more attention in class. One study has shown that student athletes are eight-times more likely to graduate than non-athletes. Yet, despite this, public school districts have cut $3.5 billion from their school athletic budgets. We are not only losing athletes through these cuts, we're losing the students themselves. I propose we launch Sports Empowerment Zones. The Zones would target schools that are failing the most. Instead of trying the same-old formulas for educational reform, what we will do is gather sports-based youth development programs to rally around these zones. We will challenge every student to sign up for at least two teams per year, whether it be baseball, basketball, swimming, track, lacrosse or biking. We will engage parents not to come out to hear if their kid “is failing or not” but to come out and cheer for their kid at a game or a competition or a race. We will engage the local police to ensure that the school grounds are safe throughout the extended day. We will train the coaches to talk to their players about academic goal setting, health, wellness, and gang prevention. And most importantly, we will use the joy of sports to attract kids to attend school more often and to set aspirations for themselves that use the values they learn as athletes on and off the field. Sports Empowerment Zones will do more to turn around the dropout rate than any other education reform currently available. They will also be cost-effective for us getting real results in our failing schools. So next time you pass by a failing school, just imagine what it might look like to see a sign “You are Entering A Sports Empowerment Zone” and then see that school surrounded by kids with their coaches. All of us, from sports program leaders to school administrators to parents, must advocate for sports in our community if we are to achieve these results. Secretary Duncan certainly gets the value of sports in his life. Let's remind him and our local school administrators the value it can have on the lives of so many other students as well.